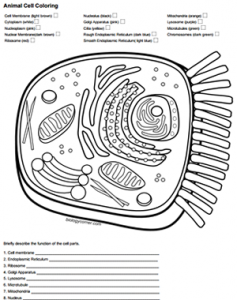 This worksheet requires students to color a drawing of animal cell according to directions. Students may need to use their book or other resources to identify parts of the cell, like the mitochondria, golgi apparatus, endoplasmic reticulum, and ribosomes. This activity is a simple reinforcement worksheet to help students learn the structures found within a typical animal cell and what those structure might look like on a diagram. Further reinforcement can be assigned with Simple vs. Complex Cell diagrams, where students must label cells on an image. Students are sometimes confused by diagrams that don’t resemble the ones they have seen in their textbook, so I stress to my students that these drawings are just representations of what an artist imagines the organelle looks like based on electron microscope images. This can also be assigned with the plant cell coloring. Thanks, helped in my science class!